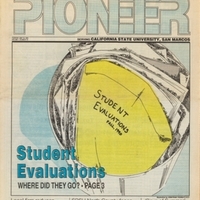 Volume 1, Number 16 of the first independent student newspaper on the CSUSM campus. The Pioneer staff reports on student evaluations. Jose Chapman wins the Associate Student Presidential runoff election. May 14, 1991,” University Archives at the CSUSM Library, accessed April 18, 2019, https://archives.csusm.edu/student-newspapers/record/24.